Family events happening around Cedar Park during the month of September. Follow the links below for descriptions time, place and all the details for each event. Thinking about buying a house, but afraid you may not be qualify? Whether you are a first-time buyer or moving up, there are a few steps to take and make the buying process enjoyable. Before looking at any houses, or doing any searches on any real estate sites, you need to take the following three steps. What is the minimum credit score (FICO score) required to qualify for a mortgage? What is the maximum Debt To Income ratio (DTI ratio) allowed? 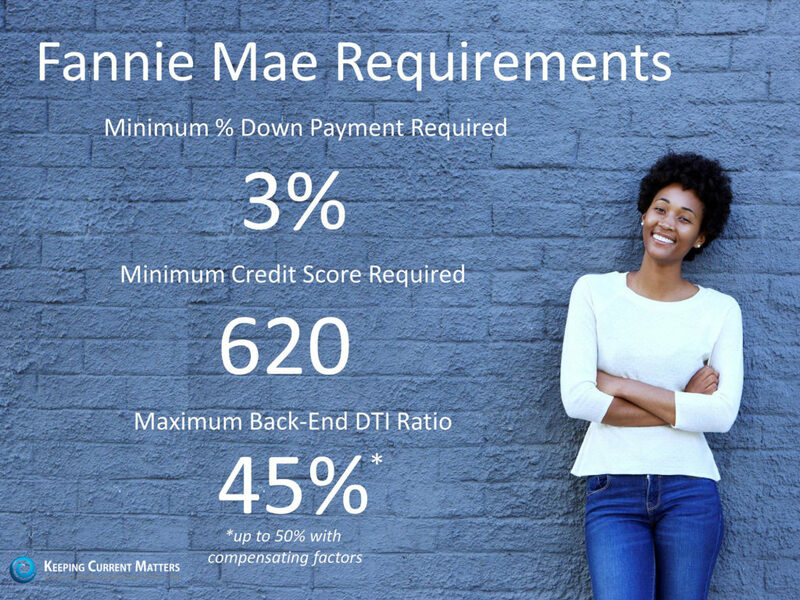 To be able to get a loan and be able to afford the monthly mortgage payments, you need to have at least a %3 down payment, a minimum credit score of 620 and debt to income ratio of 45% or better. I have mentioned some of the down payment assistance programs here. You can download more information about these programs here. Younger generation, especially the millennial, tend to do most of their shopping, including mortgage rates, online. 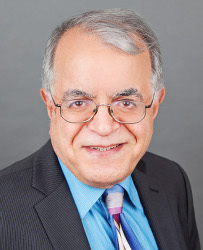 While it is quite possible to find good rate online, but qualification and application process, including credit issues, better be dealt with locally through your local banks or mortgage brokers. A local lender can sit down with you face-to-face and talk about the application process, current rates and current programs available for first-time homebuyers. Most online lenders aren’t necessarily local and may have teaser rates on their websites. There are many down-payment assistance programs that are only available to local buyers, especially first-time buyers. 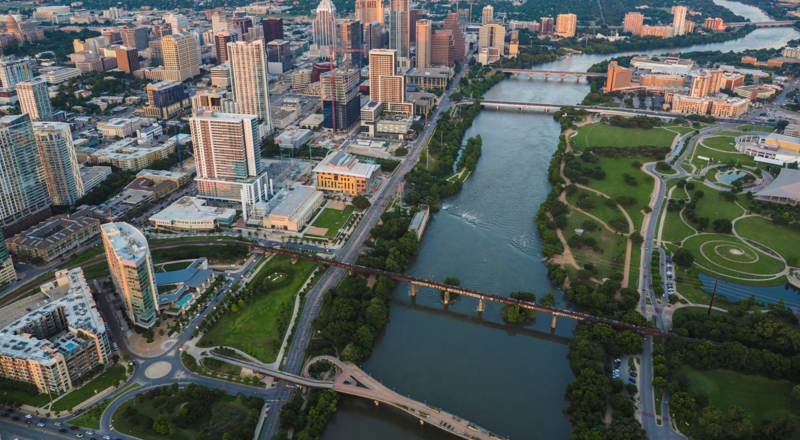 In a competitive market such as Austin, where the number of buyers searching for their dream home outnumbers the number of homes for sale, buyers need to stand out and get noticed. One way to get noticed and have a competitive advantage is to get pre-qualified or, even better pre-approved, for a mortgage before you start your search. In today’s Austin market, most real estate agents require their buyer clients to have that pre-approval letter in-hand before they take them out looking at houses. Most real estate professionals have relationships with lenders who will be able to provide you a list of few lenders and help you with the pre-approval process. Once you have selected a lender, you need to fill out a loan application and provide important information regarding your credit, debt, work history, source of down payment and rental history. This is what most first-time homebuyers dread and are weary of filling out the application with a lender. They are afraid of the negative credit report and how it may affect buying their dream home. However, even if there are negative points on your credit report, it’s best to find it early in the process with enough time to correct the. If you are considering purchasing a home, make sure you are aware of all your options and don’t overestimate the credit and down payment requirements. There are different options and many available programs to help you achieve your dream of owning your home. 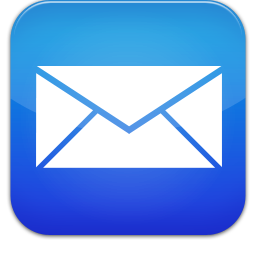 Drop me a note here, with your comments or questions. I hope you had a great July and enjoying the summer! Houses in Round Rock are selling at very fast rate this summer season. The number of sold houses had an almost 25% jump relative to last year. The average Days on the Market for selling a home is the area is 27 days and the median is only 8 days; during July nearly half of the 229 houses were sold in 8 days or less! There was a alight decrease in the number of houses listed for sale relative to last year during the same the same time. 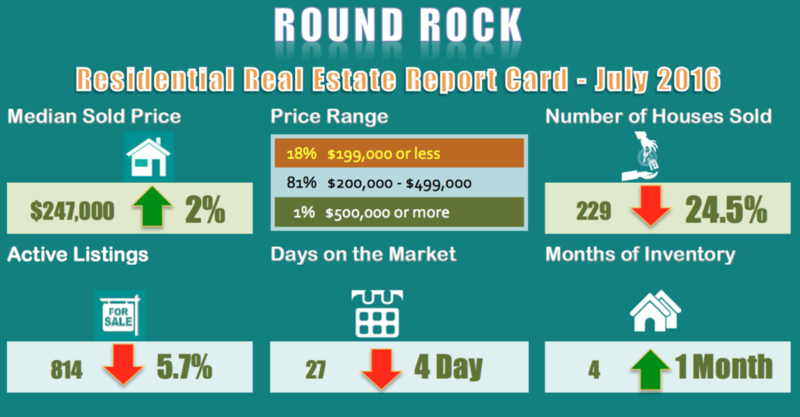 Here is a report card for single family home sales in Round Rock area in July 2016. All comparisons are against July 2015. All this has affected your home’s value! A special “Thank You!” to my clients and YOUR neighbors who continue to leave me reviews after a real estate transactions. You may read the client reviews below, along with other real estate resources that you may find valuable! Houses in Pflugerville are selling at an expected rate for the summer season. The average Days on the Market for selling a home is the area is 28 days and the median is only 8 days (during July 69 out of 138 houses were sold in 8 days or less). The number of houses listed for sale is slightly higher than last year at the same time. 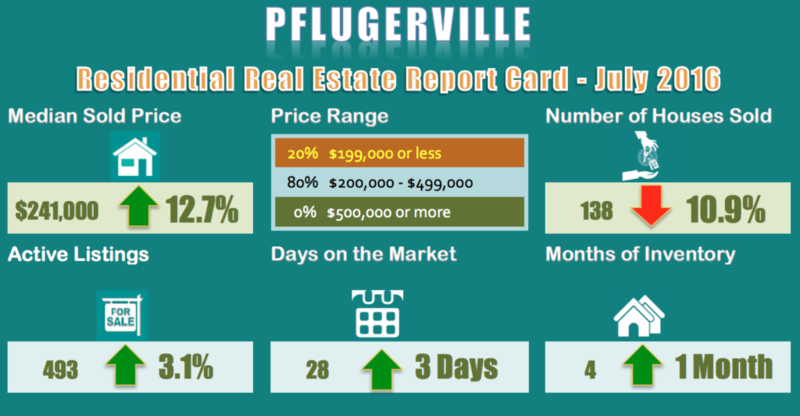 Here is a report card for single family home sales in Pflugerville area in July 2016. All comparisons are against July 2015. 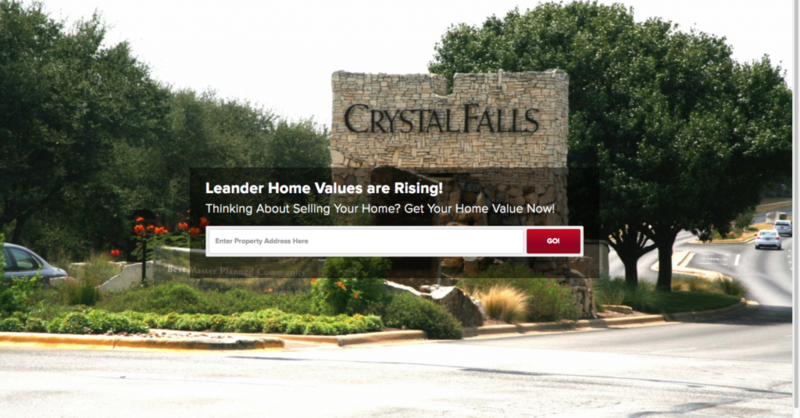 Leander Real Estate market was as hot as the weather in July! 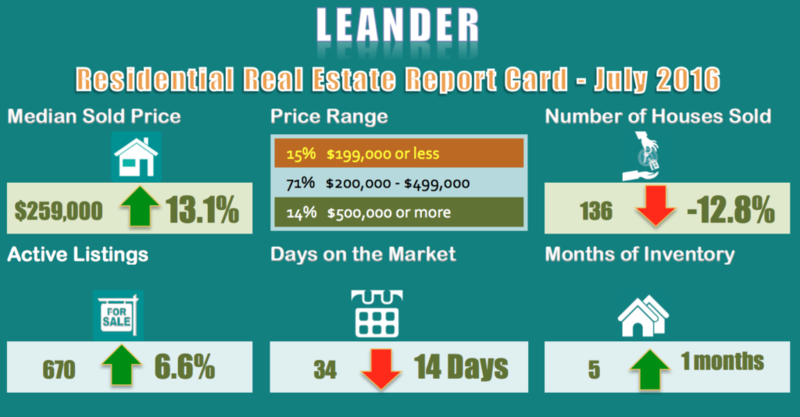 Leander, along with neighboring Cedar Park, has one of the lowest Days on the Market for selling a house; 34 days on the average and a median of only 14 days (during July half of the 136 houses were sold in 8 days or less). That is a quick sale! There are lots of new construction in the area and a large part of the active listings (670) is due to the large inventory of new houses. Here is a report card for single family home sales in Leander area in July 2016. All comparisons are against July 2015. 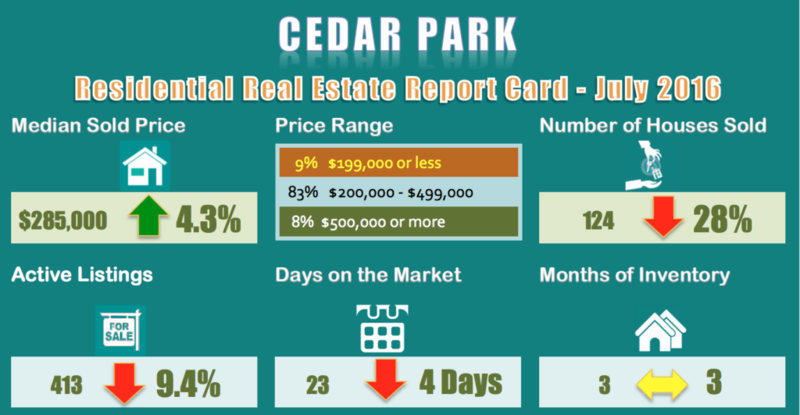 Cedar Park Real Estate market was as hot as the weather in July, In fact among the Austin neighboring cities, Cedar Park has the lowest Days on the Market for selling a house; 23 days on the average and a median of only 8 days (during July half of the 124 houses were sold in 8 days or less). That is a quick sale! Here is a report card for single family home sales in Cedar Park area in July 2016. All comparisons are against July 2015. Cedar Park Real Estate market was as hot as the weather in July, In fact among the Austin neighboring cities, Cedar Park has the lowest Days on the Market for selling a house; 23 days on the average and a median of only 8 days (during July half of the 124 houses were sold in 8 days or less). That is quick sale! More specifically in the Cypress Creek and neighboring communities 62 houses were sold in July. To find out the details of each sale, including the price the properties were sold and how long they were in the market, see the detail map here.